In a highly artistic program of great integrity, Renée Fleming and Melbourne Symphony Orchestra present a thoughtfully curated program of musical treasures, eschewing the chocolate box greatest hit parade that is surely the temptation of every visiting opera superstar. The evening begins with a slightly reduced orchestra playing Four Orchestral Interludes from Richard Strauss’ Intermezzo. This significant work, running around 25 minutes, displays the careful control and expert playing of the orchestra musicians. The expressive, highly detailed music features little percussion, with a lyrical sound overall. Maestro Sir Andrew Davis exhibits meticulous leadership of the orchestra, particularly with the first three gently flowing pieces. The fourth interlude, “Happy Ending,” is a lively piece, bringing the segment to a stirring finale. During a brief break, some 25 additional musicians join their colleagues on stage, boosting the numbers of brass and double basses in particular. Fleming makes her first entrance in a form fitting, strapless, dark silver metallic gown. Her flowing, gold-splashed cape adds a heightened air of theatricality to her appearance. Fleming’s thick, golden blonde hair is styled to complement her warm, heart shaped face, and she projects palpable warmth and grace from the stage to the mighty Hamer Hall auditorium. The three gorgeous songs of Ravel’s Shéhérazade are placed largely in Fleming’s middle register, facilitating her expressive, heartfelt delivery. While a concert performance may often involve virtuosic singing chosen to impress and dazzle with vocal fireworks, Fleming sings with earnest, straightforward quality, bringing the audience towards her with an unshowy, carefully considered program. Smooth, natural, unforced delivery brings out the gold and silver tones in Fleming’s truly lovely voice. For the second half, Fleming emerges in a royal blue satin strapless gown with matching shoulder wrap, which she often clutches about herself in the delight of performing. The second half begins with two of Canteloube’s Songs of the Auvergne. First, the brisk frisky folk song “Malurous qu’o uno fenno,” followed by “Baïlèro,” in which Fleming lovingly recreates a romantic dialogue between shepherd and shepherdess. The second half features a small smattering of well-known opera favourites, including “The Jewel Song” from Gounod’s Faust. Portraying Marguerite’s unbridled outpouring of avaricious pleasure as she explores a treasure chest of jewels, Fleming reminds us of her consummate acting skills. Before the final bracket, Fleming shares some characteristically generous words about her pleasure in returning to Melbourne and her thrill at debuting, on invitation from Sir Andrew Davis, with the Melbourne Symphony Orchestra. In an exquisitely delicate selection, Fleming sings of the all-consuming love a teenage girl has for the title character in Mascagni’s L’amico Fritz. This is followed by Tosti’s charming song “Aprile,” an ideal choice for a city just on the very cusp of spring. The first two encores are popular music theatre selections. The Gershwin’s “Summertime” from Porgy and Bess gives Fleming some of her highest notes of the evening, and she soars beautifully through these, filing the text with plaintive longing. For a rousing finale, the crowd are invited, in fact strongly encouraged, to join Fleming in singing ever popular Lerner and Loewe standard “I Could Have Danced All Night” from My Fair Lady. The pleasure Fleming exhibits in sharing this singalong moment with the audience is another example of her inner joy and good will towards all. 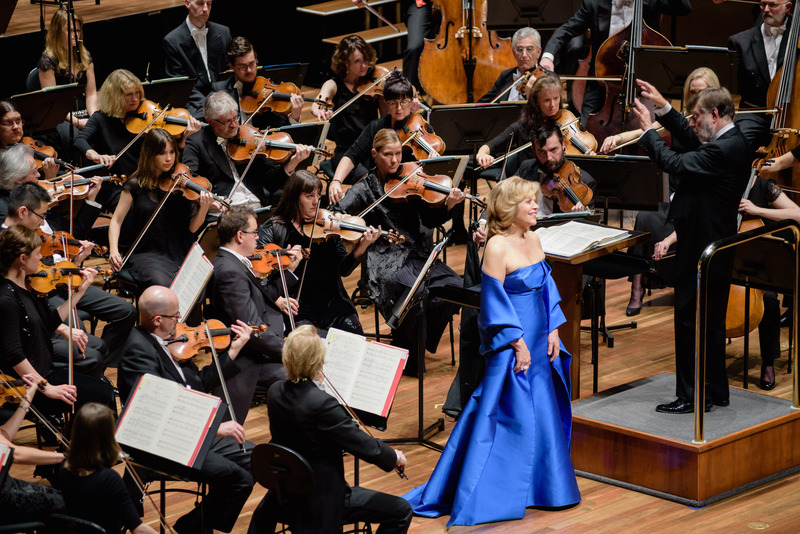 Melbourne Symphony Orchestra will once again spend An Evening with Renee Fleming at Hamer Hall, Arts Centre Melbourne on Saturday 5 September 2015. That concert will be recorded for broadcast on ABC Classic FM on Sunday 6 September 2015 at 1pm.